I love their Gears! Gears! Gears! Wacky Wigglers Motorised Building Set - we have it and the kids love it! I love the Playground Engineering & Design Building Set because it looks like so much fun and my son would love it! The market set with the basket to go with the till! the puzzle globe is very cool! I like the puzzle globe as it looks fun yet educational. I love the Mini Muffin Match Up Maths Activity Set as it encourages early maths skills. I love the motorised solar system. Perfect for my son who is learning about space this term and is advanced enough to last for years to come. I'd say the Puzzle Globe as it's a lot fun, and educational. Crocodile Hop™ Early Maths Activity Set because it keeps you fit as well ! I love maps and globes and want the children to know about countries other than their own so would buy the Puzzle Globe and the Giant Inflatable Labelling Globe if I could. I like the Gears Dizzy Funland Motorised Building Set as it looks really good fun. My daughter loves science and nature so we think the Sedimentary Rocks Collection is fab! I love the Play Foam - you can enhance creativity with less mess! The Mini Muffin Match Up Maths Activity Set really appeals to me. I like the look of the Dizzy Fun Land Motorised Building Set because it builds motor and logic skills. this looks amazing, would love the children i work with to play with this! I always wanted a pretend post office when I was younger so love the look of their post office! I'm sure my daughter would love it too. I love their story cubes which get children creating their own exciting adventures! I like the look of the Mathlink Cubes! I played with those when I was at school and they are great for co-ordination skills! I love the Puzzle Globe. I've never seen that before and my kids would love this. looks fun and educational!. Thank you. I love the super sorting pie. My son really enjoys sorting items by shape, size, colour or type and I think he'd love it. Such a great tool as well. The pretend and play international school set looks right up my my son's street so to speak! The Pretend & Play Post Office Set looks like good fun and like the fact it has wipe clean boards. Globe Puzzle, as educational and fun. I think these are great for a bit older also, to teach children about money. I love the anatomy brain model and so would my eldest! The Gears! Gears! Gears!® Wacky Factory® Building Set because they can be so creative, and it develops so many important skills too - especially as all the sets are compatible and can be combined! Ants on a log is my Son's favourite. He loves to count them. The AfterWORDS Boardgame looks fun whilst being educational. Pizza Fraction Fun Game looks brilliant. Our 8 year old is just getting to grips with fractions. I like the play doctor's set, I had one of these as a child and loved playing with it. The Puzzle Globe looks brilliant. The Pretend & Play Doctors Set looks really good! My little niece would love pretending to care for her dollies & teddies! The Gears! Gears! Gears!® Gizmos® Building Set as i had one at my primary school! I love the Snap Cubes because I know that my little grandson would be able to build with them and enjoy their bright colours too. The Anatomy Model Set is a great tool for teaching children how their bodies work and is something that they can use for many years and comprehend on a greater level as they get older. The recycling truck, my toddler is obsessed with bin day & the bin lorry! Lights and action motorised building set, my girls love things like this! 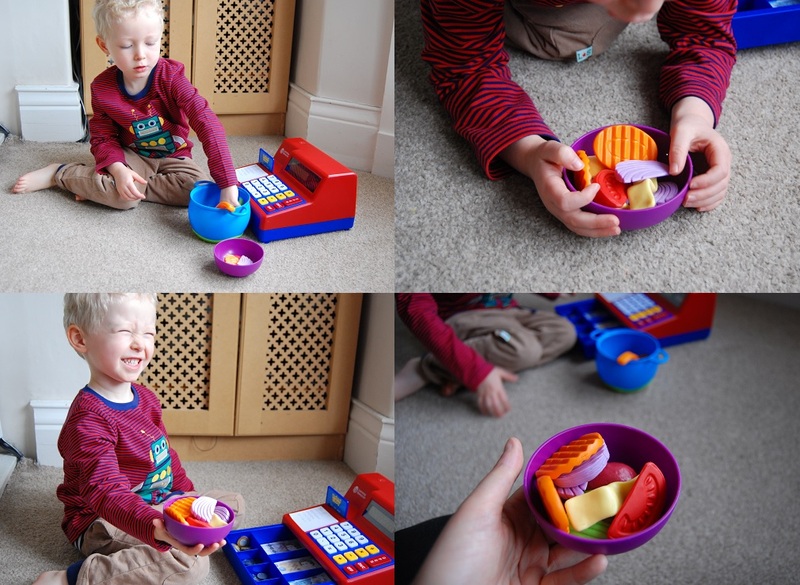 My little boy loves any pretend play and is just getting to grips with numbers now. I like the Pretend & Play® Sliceable Fruits & Veggies. It would make a great addition to the play kitchen. Lights & Action Motorised Building Set looks like a lot of fun. The Peekaboo Barn Game, because it is the kind of toy that really appeals to my little niece.